To round up our series of blogs on brownfield investigation, we take a closer look at intrusive site investigation techniques and ongoing monitoring and remediation. As discussed previously in this series, non-intrusive site investigation techniques can help pin point potential hazards and key areas that may require further, intrusive, investigation. Once these techniques have ‘done the leg work’, the scope of the intrusive investigation can generally be reduced to target key features and areas with a higher level of confidence. 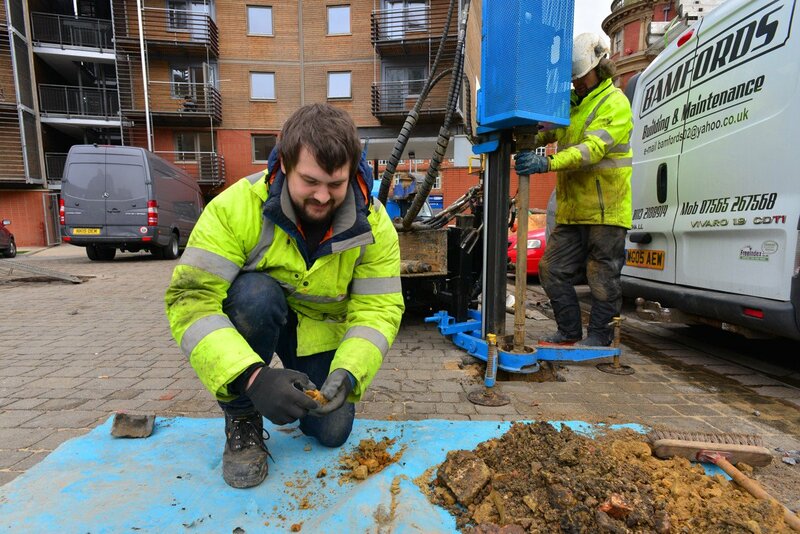 Intrusive investigation methods include a number of testing processes such as boreholes, trial pits, infiltration & soil testing to fully characterise ground conditions and contamination levels. Because the physical and chemical properties of the surrounding ground have previously been examined using geophysics, confidence can be gained that the findings at each location are characteristic of the surrounding areas. But intrusive investigations are not necessarily the end of the story. A site is not a static entity and examining how certain ground conditions change over time can be just as important as characterising the more permanent features such as bedrock and sub-soil properties. Gas and water monitoring can be carried out over a programme of weeks, months or years, using both ground installed instruments or non-intrusive geophysics. Monitoring of ground stability and deformations can be carried out through the use of precise survey techniques, and visual methods such as time-lapse photography can provide a unique outlook on site processes. Over our brownfield investigation series we’ve covered a number of techniques that can be used to collect data and build a more accurate view of the site. As site data is collated and analysed the conceptual site model takes shape, and as investigations progress the model combines all the data and becomes increasingly refined. This flexible and evolving site model means it’s possible to identify qualitative and quantitative risk assessments that can feed into the site development strategy alongside remediation statements and validation reports. The conceptual site model should not be a fixed product that is only obtained at the end of a set of investigation steps. Using the approach laid out in this blog series the model can be fluid and dynamic, becoming increasingly refined and able to direct investigation towards the areas of most uncertainty, thereby assisting in the reduction of risk. If you’d like to speak to us about brownfield site investigation on your project, call us on 0113 200 8900 or complete our contact form and one of our team will get back to you.